Naughton, Robin. 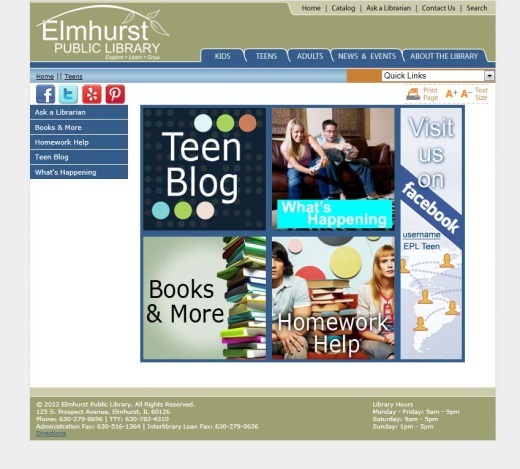 Teen Library Website Models: Identifying Design Models of Public Library Websites for Teens. Journal of Research on Libraries & Young Adults 6 (2015): n. page. Web. <Date accessed>. This paper identifies and seeks to understand website models of U.S. public library websites for teens, also known as teen library websites (TLWs). TLWs are sections of public library websites devoted to teens and only teens. Few studies have focused on TLWs, and exploring this aspect of public libraries provided an understanding of how public libraries address teen needs via their websites. TLWs were identified from the 2009 Institute of Museum and Library Services (IMLS) data file, a downloadable Excel document of all data available from the IMLS Public Libraries Survey. Using web content analysis, 60 TLWs were analyzed in 2012 and reanalyzed in 2015 to understand any changes over time. Four website models were identified, with the majority of TLWs adhering to the Reading Model, a text-heavy website with limited interactivity and media content. In addition, the results showed that in 2012 some public libraries moved from one website model to another while others no longer had TLWs in 2015. These findings suggest that there will be shifts in website design, but website models and access can be a guide to navigating changes. The paper concludes with a list of evaluation questions for best practices in designing TLWs. The Pew Internet and American Live project tracks Internet use by US teens (12–17 years old). Since 2000, the data shows that Internet usage increased with 73% of teens in 2000, 87% in 2005, 93% in 2009, and 95% in 2012. Mobile access is also growing, with 74% of teens using their mobile devices (smartphone, tablets, etc.) to access the Internet. In today’s mobile-first environment, access to the Internet has extended beyond the traditional laptop and desktop computer to include mobile devices and gaming consoles (PlayStation, Xbox, etc.). In order to address teen information needs in the design and development of public library websites for teen users, public libraries will need to consider the teen context and methods of access to the public library website. The goal of this research is to identify and understand current website models of public library websites for teens (teen library websites, aka TLWs). Public libraries have developed sections of their websites devoted to specific user groups such as children, teens, seniors, and so on. Generally, research in this area has focused on children and adults. Few studies have focused on teens and specifically TLWs. Using web content analysis to identify and document current website models of TLWs in 2012 and again in 2015, this research highlights public library websites’ representation of teen information needs and documents changes to the TLWs since the original 2012 study. What are existing models of U.S. public library websites for teens? 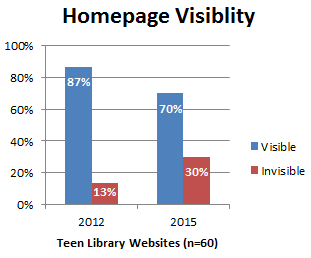 To what extent has the design of U.S. public library websites for teens changed since 2012? 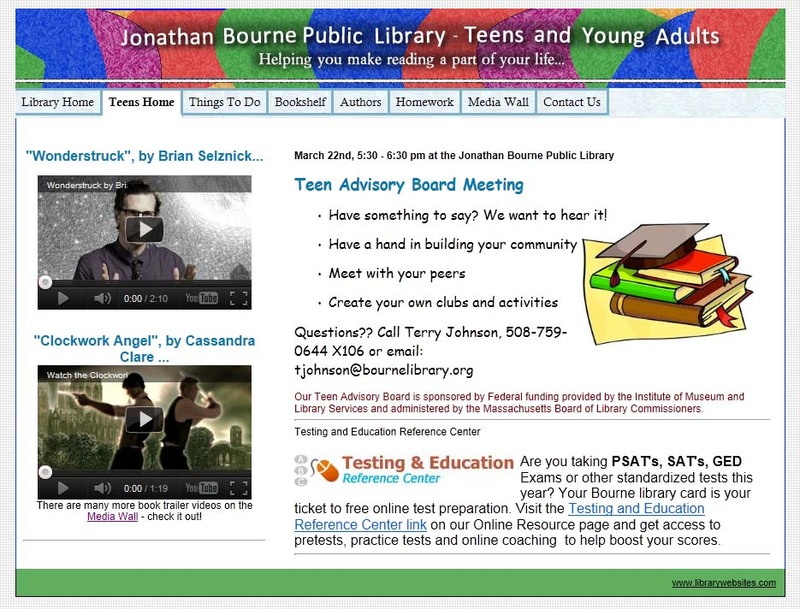 Teen information needs is a critical component to designing public library websites for teens. Researchers in this area have provided guidance on major areas of need when working with the teen population and public libraries. Hughes-Hassell and Miller researched how teens contributed to the design and development of public library websites by surveying public libraries in the United States and Canada. They suggest that library websites address teens’ needs on academic, social, and recreational levels. Agosto and Hughes-Hassell looked at the everyday life of urban teens ages 14–17 and found that the typology of information needs can be mapped to prior research on teens, which helps to provide an additional area of research within the teen population. The researchers also propose theoretical and empirical models regarding urban teen information needs, identifying seven “selves” (social, emotional, reflective, physical, creative, cognitive, and sexual) that make up urban teen development. Agosto offers a theoretical model based on bounded rationality and satisficing as they pertain to young people’s decision-making, providing four major determinants of their web-based decisions: personal preference, object engagement, human processing constraints, and contextual constraints. Agosto’s discussion provides reasons why teen websites may fail or succeed within the teen demographic, and it emphasizes the need to understand context in order to design and develop websites for the teen population. As a result, it is important for researchers to recognize that teens are not a homogenous group. Understanding the multifaceted teen context is the first step in designing and developing websites that respond to teens’ wide-ranging information needs. User interface design requires an understanding of users in order to provide solutions that respond to user needs. Current designs are often based on adult views of teen perspectives rather than on user-centered research with teens, which can provide the appropriate design solutions for the user context. To combat this, Large, Beheshti, and Rahman suggest four major categories of design criteria: portal goals, visual design, information architecture, and personalization. Each category draws on teen perspectives to design websites that respond to teen needs. Large et al.’s research focused on web users ages 10–13, who through focus groups reported their likes, dislikes, and suggestions for improvements of four web portal interfaces for children. From their findings, Large et al. advise that web portals should have a strong goal/focus but can include a related subfocus. For example, a website can have a strong goal/focus as an educational portal, but also have a subfocus of entertainment related to the educational focus. The visual design of the user interface is an immediate, almost visceral place of interaction between the user and the system. Garrett calls it the “surface” plane of the user experience, where all the other planes come together to produce a finished design. It is the first thing that users see, but visual design is a combination of research and design principles that can help to create a good user experience. Large et al. found that the children preferred a catchy portal name, good use of color, non-white backgrounds, animation, graphics, large font sizes, appropriate icons for the context, age-appropriate vocabulary, clear layout, and no advertisements. Overall the children polled wanted websites that kept their attention and were not boring, which is echoed in research into teen preferences as well. Teens left websites they considered “boring,” particularly based on the homepage design. Another area of visual design dealt with design consistency across the website. Based on a survey of public librarians who serve teens, Hughes-Hassell and Miller found that library administrators typically want to have a consistent design through the various components of their libraries’ websites. This means that many of the websites designed for youth are based on adult-looking pages that youth find unattractive. Although the librarians who responded to the survey indicated that youth were involved to some extent in the design and development process, it was not to the extent that allowed youth to have significant impact on the design. Thus, if librarians want youth to use the TLW, then they need to develop web pages with youth input throughout the design and development process. Similarly, Valenza’s dissertation research, a content analysis of ten exemplary secondary school library websites identified by a Delphi panel of experts in school library research, found that there’s a debate between library administration policies that dictate using mandated templates versus employing creativity in designing unique school library websites. On one side of the debate, Delphi members suggested that there’s a limitation in what can be done when school districts mandate templates; but on the other side, Delphi members argued that creativity can still be achieved within the context of templates while providing consistency and a point of reference in terms of the overall user location. Valenza suggests that consistency can be improved with the development of models and tools that can help to identify and evaluate school library websites. Large et al. found that for information architecture, young web users preferred directness, keywords, subject categories, options for meta-searching, organization and possible limitation of search results based on relevance, and spell-check. Information architecture is rooted in the understanding of the content and how best to build a structure that allows easy navigation and understanding of that content. Thus, one theme seen throughout the literature is age-appropriate design. Age-appropriate terminology for labels and indexing can determine if children are able to understand and use the website. Within the health information domain, Franck and Noble found that although there was some breakdown by age on the original Children First for Health (CFfH) website (http://www.childrenfirst.nhs.uk/), it was unclear and further research revealed the need for age-appropriate structure to respond to the information needs of children (ages 7–11) and teens (ages 12–18). The fourth category focused on personalization as a way to resolve some of the preferences and suggestions provided to youth. Personalization and customization is a theme seen throughout the literature and speaks to the need to respond to individual preferences. The terminology is sometimes used interchangeably, but personalization refers to adjustments to the user interface based on user’s information, past activities, and attributes, while customization gives the user the option and power to change and adjust the user interface. Agosto found that personal preference (choice) was important for teen website design because it offered teens the option of changing background color, turning off background music, or adjusting the site to suite their particular information needs. Agosto describes teen preferences in terms of graphical/multimedia and subject content, showing that teens had strong preference for designs that catered to their own personal needs. However, there is some evidence suggesting that now that teens are spending more and more time using the web and ubiquitous computing technologies, they are less interested in visual design features and more interested in using technology for fast, easy communication. The current research study used web content analysis to identify and explore current public library websites for teens. Traditional content analysis emphasizes five steps: (1) research questions; (2) research sample; (3) categorization scheme; (4) application of coding to sample; and (5) analysis and interpretation of results. Drawing from content analysis, web content analysis is an unobtrusive, systematic research technique used to study websites. Using elements of traditional content analysis, web content analysis expands the method to include the dynamic nature of the web, the mixture of multiple media types in communication, and the effect of the web on the traditional approach. Herring proposed methods where web content analysis is the larger umbrella covering different approaches to content analysis of websites, such as image analysis, theme analysis, feature analysis, link analysis, exchange analysis, language analysis, and other methods of content analysis appropriate to the web as it continues to evolve. Using web content analysis provided a systematic method of analyzing specific aspects of TLWs. The 2009 IMLS Public Library Data Files on over 9,000 U.S. public libraries were selected as the source for data for this study. Seventy-three percent of public libraries listed in the IMLS data file, or 6,801 libraries, had websites. To reduce the number of websites selected for analysis, public libraries serving three population ranges were selected for this study. Simple random sampling was used to select 20 TLWs for each of the three population ranges, for a total of 60 TLWs for analysis. Including a TLW in the sample for analysis required that the public library website had a section devoted to teens and only teens. The teen section of the public library website could not be shared with any other population group, such as children or adults. The sampling unit for the data collection is the “teen website,” where website refers to the teen homepage and all supporting pages. The term “website” is used for single or multiple web pages for the teen section. Some websites are dynamic and can change rapidly over time with no guarantee that today’s content will remain tomorrow. As a result, stable versions of the websites were needed for consistency in the analysis. Researchers printed out the websites as a means of capturing a snapshot of the data at a given period of time. The printouts provide the stability that the researchers needed to do a systematic content analysis but may miss some of the dynamic content that the website provides. For this research, stability was achieved through rapid data collection, where data is collected quickly and efficiently with a goal of minimizing change that may occur over time and achieving a stable data set, which is necessary for a systematic review of the data. Screenshots of three levels were recorded. The first level was the main public library website homepage, the second was the TLW homepage, and the third was all secondary links from the TLW homepage that were internal to the website. Links to external websites were not recorded. As an additional measure and to account for the dynamic nature of the web, a local digital version was archived. A subset of websites was reviewed to identify features and themes pertaining to the research questions, a necessary grounding for a systematic analysis. An additional source for structuring the analysis was achieved through a review of the human-computer interaction (HCI) research literature with a particular eye toward elements of user experience, information architecture,  and user interface design. Loosely building on Garrett’s five planes of user experience (strategy, scope, structure, skeleton, and surface), Large et al.’s design criteria, and other HCI research literature, the organizing structure used to develop a coding system included website presence, information architecture, visual design, and personalization and customization. A database was developed to store the data and assure coding consistency. Library websites generally fall within the informational website type because the main goal of the library website is to provide information to its users. As informational websites, the analysis looked at the nature of the designs of the current TLWs based on the structural and functional organization of the website. 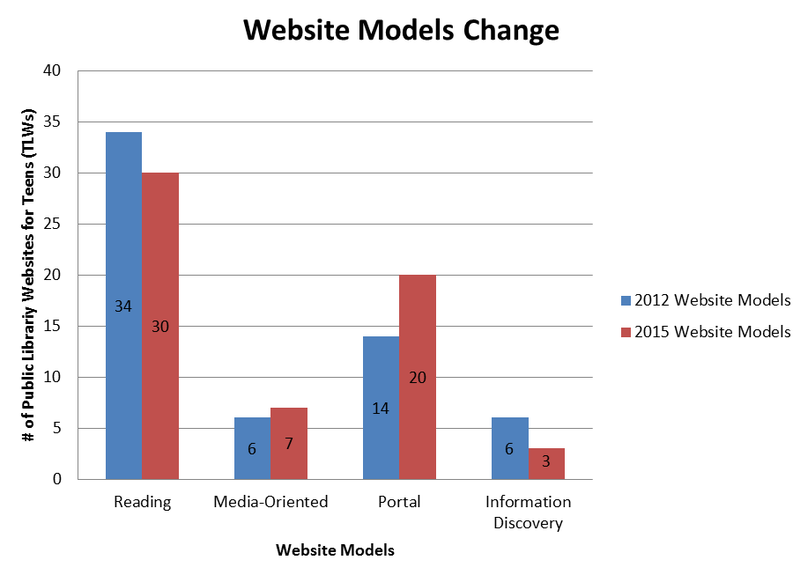 Four website models were identified: Reading, Media-Oriented, Portal, and Information Discovery. The Reading Model (fig. 1) is predominately a text-based content representation design, where information is presented as paragraphs or blocks of text throughout the user experience. The website may include text, images, and links, but overall there is a limitation to what the user can do beyond reading the information on the screen and clicking a few links. The content appears static and, depending on the visual design of the website, it can also appear as if it transitioned from a printed document directly to the screen with little change or interactivity. In 2012, 34 TLWs (57%) were identified as Reading Models, and in 2015 that number dropped to 30 TLWs (50%). This suggests that current TLW designs need to consider the meaning of presenting a Reading Model to a teen population that prefers not to read and considers large blocks of text “boring.” Reviewing the TLWs in 2015 showed that there is some movement in shifting from a Reading Model to another model that provided more options for teens. The Media-Oriented Model (fig. 2) is a design that attempts to incorporate varied media into the user experience when presenting information. This model is just a step beyond the Reading Model, but it is not a completely media-driven website, where the majority of the website is dynamic and interactive. The Media-Oriented Model begins to include videos, chat features, social networking displays, visual catalog browsing, embedded gaming, eBooks, and other interactive tools that provide users with multiple layers of interactivity. In 2012, 6 TLWs (10%) were identified as Media-Oriented Models, and in 2015 that number increased to 7 TLWs (12%). It is not a significant increase, but it suggests that current TLW designs are still in the process of becoming Media-Oriented by incorporating available media technologies that could enhance the user interaction and experience. The Media-Oriented Model provides teens with alternative means of interacting and accessing information on the TLW. The Portal Model (fig. 3) is a category-based design of the TLW homepage that provides teen users with sectional breakdowns of available content. Teens must click a category to access available resources. The Portal Model includes interactive content and varied media types. It can have elements of other design models such as Reading or Media-Oriented Models. In 2012, 14 TLWs (23%) were identified as Portal Models, and in 2015 that number increased to 20 TLWs (33%). This suggests that there is a significant shift from other models to the Portal Model. The Portal Model provides teens with an easy way to identify the available category of content and then drill down to access more specific information. The Information Discovery Model (fig. 4) provides teens with all available information and dynamic updates on the TLW homepage. Teens get information immediately and only click when they want additional information. In 2012, 6 TLWs (10%) were identified as Information Discovery Models, and that number decreased to 3 TLWs (5%) in 2015, a 50% drop. This suggests that some public library websites are creating alternative models with dynamic content but may still be struggling with the Information Discovery Model. The distribution of the website models by library population service area showed that the Reading Model appeared most frequently in the current TLWs of the largest and smallest population range in the study. The Reading Model also represented the dominant model identified. Since 2012 some TLWs were redesigned, and in a number of cases the redesign shifted the TLW from one model to another (fig. 5). There were shifts from the Reading Model to the Media-Oriented and Portal Models. There was only one TLW that shifted from a Portal Model to a Reading Model. Two Media-Oriented TLWs shifted to the Portal Model. There were no TLWs that shifted to the Information Discovery Model from another model, but three TLWs shifted from the Information Discovery Model to the Portal Model. Taken together, this suggests that there will continue to be changes in public libraries’ response to the needs of teen users, via the TLW. Homepage visibility refers to the presence of the TLW link from the homepage of the library’s main website. 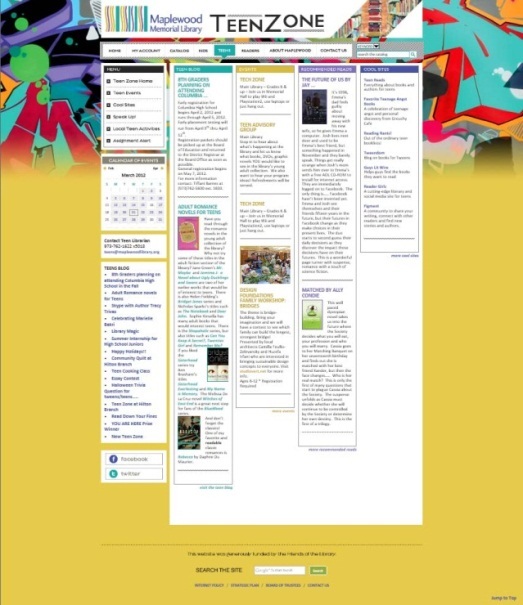 It describes whether the link is above fold (no scrolling necessary) or below the fold (scrolling required), and how visible (easy to identify) or invisible (hidden in a submenu) the link appears, to determine if teens can easily access the TLW from the homepage of the public library website. No distinction was made with regards to the impact of the visual design of link such as font, size, or graphical display. The data identified if the link was present, immediately visible, and clearly labeled. Homepage visibility revealed that the majority (87%) of the websites analyzed provided a visible link that appeared above the fold on the main library website, and 8 (13%) of the websites included links that were not immediately visible and required multiple clicks to access the TLW. Invisible links appeared as submenu items of the main library website. 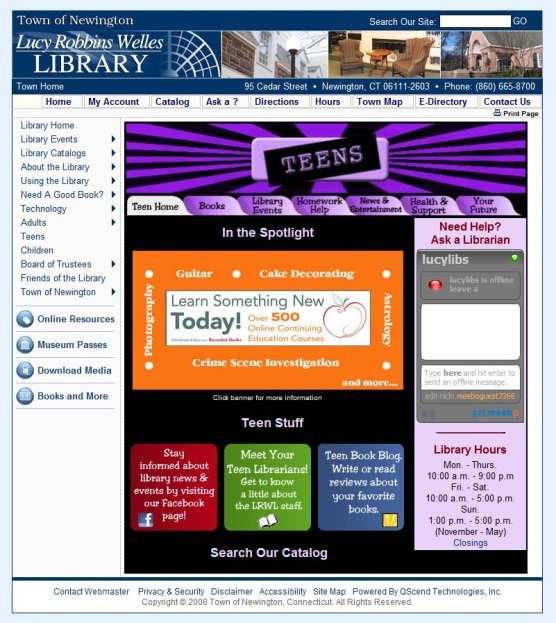 For example, on the Bryant Library website, users needed to click on “Library Services,” which produced a drop-down menu where users would then click on “Young Adult (BL Teens).” This process required teens to figure out that the teen section was a part of the library services section in order to get to the TLW. In addition, the label of the teen section could be a bit misleading without the parenthetical “BL Teens.” The invisibility of the TLW link means that teens would have a difficult time accessing the TLW. In 2015 a review of homepage visibility found a significant drop of visibility from 87% to 70% of the websites with a visible link above the fold (fig. 6). The drop may be due in part to websites that no longer provided a teen section for their users. Eighteen (30%) of the websites were identified as invisible and, of those 18, 6 (10%) websites with teen sections in 2012 no longer provide those sections in 2015. 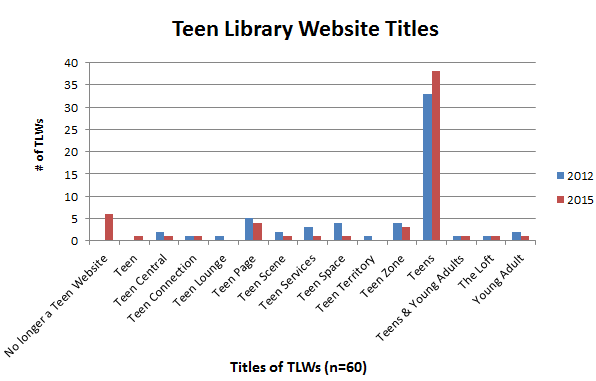 The majority (95%) of TLW titles include the word “teen” in the name (fig. 7). In 2012, 33 (55%) of the websites used only the word “teens” as the title of the TLW. The use of the word “teens” for identifying TLWs may make it easier for users to recognize the access point to the TLW from the main library website. Teens do not have to guess where the teen section is located on the website. The trend of using the word “teen” in the name continued in 2015 for the websites that still provided a teen section. Six (10%) of the websites no longer have a teen section. One website title changed from “Teen Zone” to “Teen,” which made it the only website in 2015 with the singular “Teen” title rather than the popular “Teens” title. The use of “Teens” continues to increase as compared to the 2012 data. TLWs were analyzed with an eye toward teens’ access to search options from the TLW and not just the main library website. Accessing a search while on the TLW, teens could find information without clicking back and forth between the main library website and the TLW. As expected, the majority of TLWs, 52 websites (87%), provided teens with access to search the library catalog from the teen section. These search options were either a link to the catalog or a search box that allowed teens to search directly. Some appeared as part of global navigation or local TLW navigation. Eight (13%) of the TLWs were identified as not providing teens easy access to search the library catalog directly from the TLW. In some cases, even the link to the catalog search on the main library website was difficult to find. For example, Jonathan Bourne Public Library provided a link to the library’s catalog on the main library website homepage, but the link was not part of the main navigation nor did it appear on the TLW. In addition, teens needed to click out of the TLW to perform a search and also needed to know that “CLAMS” was the library catalog in order to click on the appropriate link to access the catalog search. There was almost an equal split between TLWs that provided the option to search the website content and those that did not. Only a few TLWs (8) provided additional types of search options such as the ability to search downloadable books and the Internet. In 2015 the number of TLWs that provided access to search the library catalog increased from 52 (87%) to 55 (92%) websites, showing the importance of easy access to resources for teens. Four of the five remaining websites no longer had TLWs, and only one did not provide easy access to search on the TLW. The one website was the Bourne Public Library, which remained the same as it was in 2012. The majority of TLWs included some form of navigational system that allowed teens to explore and find information. Global navigation systems appeared throughout the user experience for the library website, including the teen section. For some libraries that were a part of a city website, there were multiple global navigation systems representing the city and the main library websites. Forty-nine (82%) TLWs had a global navigation system that represented the overall library navigation of the website. On the website, global navigations were found in multiple locations (22 TLWs), top (17 TLWs), left (9 TLWs), and right (1 TLW). Multiple locations indicated two or more global navigation systems, which appeared in any combination of top, left, and/or right. The global navigation systems created consistency of design, but at the same time, limited the possibilities for TLW designs specifically for teens. The teen sections of these websites took up a small portion of the overall available website space and existed mostly in the content area of the website design. For example, the Lucy Robbins Welles TLW appears squeezed in the content space available (figs. 8 and 9). Three (5%) TLWs had navigational systems that functioned similarly to the global navigation, but only sections of the website had global navigation structures. Eight (13%) TLWs did not include global navigation. 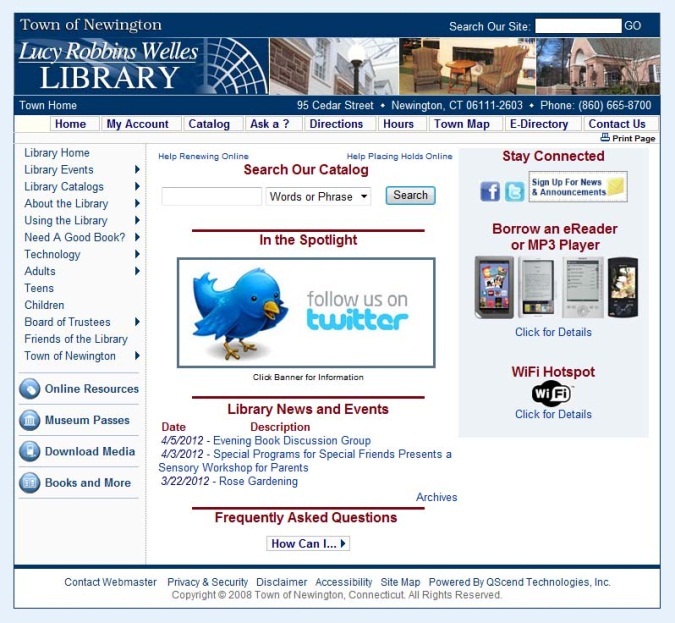 The lack of global library website navigation separated these TLWs from the main library website and their counterparts with global navigation. These TLWs existed in their own domain, sometimes literally, and presented a user experience different from the main library website. In addition to the global navigation systems on the websites, the TLWs included local navigation systems that were specific to the TLW. Forty-eight (80%) TLWs included a local navigation system that was specific to the teen section of the website whether there was a global navigation or not. The inclusion of the local navigation provided the TLWs with content-specific navigation that presented an additional method of making the TLWs self-contained. Twelve (20%) TLWs did not include a local navigation system, but all twelve included global navigation. In 2015 global navigation was found on 53 websites, representing an increase from 82% to 88% of TLWs using global navigation. Local navigation decreased from 48 TLWs to 39 TLWs, representing a drop from 80% to 65% of public library websites providing navigation specific to the teen section. This suggests that the global navigation functioned as the overall navigation for the TLW and that there is some transition from localized teen section navigation to global library navigation. The website models offer perspectives on the design of TLWs, ranging from a text-based website to more interactive and dynamic websites. The four models suggest that there are variations in the ways that public libraries present information to teens. The Reading Model represents a majority of the website designs, which can be a potential issue for the future of current TLWs. Research suggests that teens would consider the Reading Model to be boring and plain. This means that teens would spend less time on the website because there is limited interactivity and dynamic content to keep them engaged. As a result, teens would leave the website and possibly never return. Thus, the Reading Model for a TLW needs to be adjusted to incorporate more interactivity and visual elements to offset multiple blocks of text on the screen. The Media-Oriented Model is a move closer to interactive and dynamic content. It shows an incremental step in the design of TLWs that goes beyond the Reading Model. Teens are able to interact with media assets such as images, videos, carousels, and so on. This interactivity provides teens with a means of exploring the TLW content in multiple ways. The Portal Model is a category-based window into the available content on the TLW. It is not minimalist design, but it is a design that limits the amount of content and activity on the homepage of the TLW while providing teens with a view of accessible content categories. Representing the second largest group of TLWs, the Portal Model allows teens to select a category of information and venture into that space. This provides teens with multiple avenues to explore the content. The Information Discovery Model is a direct contrast to the Portal Model because it provides not just a window but rather an open field into the available content on the TLW. It is a design that presents all the information immediately and regularly updates that information dynamically. Teens do not simply select a category to explore; they select an item, which provides an additional level into the available information. Although these are two contrasting models, both provide interactivity and dynamic content to teens. The data suggests that the Information Discovery Model is the least used model but the most dynamic of the four models. When thinking about the website models, it is important to understand that they are modes of presenting information to teens and, as such, should be paired with research about the teen mental models for that specific TLW. The relationship between teens and the website is critical to understanding teen expectations and how those expectations can be met via the website. Analysis of the TLWs’ access, title, navigation, and search function showed elements of public library user experience. It is critical that teens can easily access the TLW from the main library website and navigate the information that the website provides. Homepage visibility seeks to address how teens access the TLW from the homepage of the main library website. When arriving at the homepage of a public library website, can teens easily identify how to access the TLW? Is access to that TLW clearly visible without having to scroll? The answers to these questions were drawn from the data, and it suggests that there was a shift toward invisibility from 2012 to 2015. This presents a concern because teens will need to spend more time finding the access point to the TLW. If they fail, then they may leave the website believing that there is no TLW. Such a failure means that teens will not benefit from the resources available to them because they are unable to access the website. The title of the website also contributes to teens’ ability to easily access the TLW. What is the TLW called? Will teens know that it is for them? The data on this suggest that there is a positive move toward using the word “teens” as a title for the TLW. This is a clear and visual indication to teens that if they see the term “teens,” they can assume that clicking the link will take them to content specifically for teens. This is not to suggest that all TLWs should be called “teens,” but rather that the word “teen” should be somewhere in the title of the TLW to identify it to its teen users. The navigation and search options on the TLW determine how teens explore and access information on the website. As the data suggests, there is no one way to structure the website. There can be multiple navigational systems that account for both global as well as local navigation. However, multiple navigational systems can take away from the content of the TLW as well as make it difficult to know exactly where to find specific information. Local TLW navigation provides teens with their own method of navigating the TLW and ways of accomplishing their goals. Similar to navigation, the search function provides a way for teens to find information that is not currently visible. For libraries, catalog search is critical and, as such, access on the TLW reduces the number of clicks and steps for teens to find resources. The data suggests that catalog search is a global feature on many websites and that teens can easily access search directly or via a link to the catalog. This study focused on three library service population ranges and, therefore, can only account for TLWs within those population ranges. Thus, it is possible that TLWs in the population ranges not studied may provide additional insight into TLWs. Another limitation of the study was that it did not address the visual design of the TLW. Visual design can be subjective, and thus it is difficult to compare the visual design of TLWs objectively. Two designs may be dramatically different, but both can accomplish the same goal. Alternatively, two designs can appear the same, but one website accomplishes the goal while the other does not. Using web content analysis, this study focused on identifying website models of public library website for teens (TLWs) and how elements of TLWs changed from 2012 to 2015. Understanding current TLWs, four models were identified. Based on frequency of use, the four models included the Reading Model, the Portal Model, the Media-Oriented Model, and the Information Discovery Model. Each model offered a way for public libraries to gain a high-level understanding of the website design and presentation to teens. Homepage Visibility: Access to the TLW is clearly visible and easy for teens to find on the public library website homepage. Where is the TLW link located on the homepage? Does the link to the TLW appear above the fold (no scrolling) or below the fold (scrolling required)? How visible is the TLW link on the homepage? Is it easy to find immediately (visible) or difficult to find (invisible) because it is in a submenu or not immediately apparent? How is the TLW link labeled? Does the link use terminology that teens recognize or terminology that is more library-centered, which teens may or may not recognize? TLW Title: It is easy for teens to recognize that the website is for them. What is the title of the teen website? Do teens know and easily recognize the title? How consistent is the use of the TLW title throughout the website? Are the TLW link label on the public library website homepage, TLW title, TLW URL, and all references to the TLW consistent throughout the website? Search: Teens can search available content from the TLW. Where is the search located, and how do teens access it? 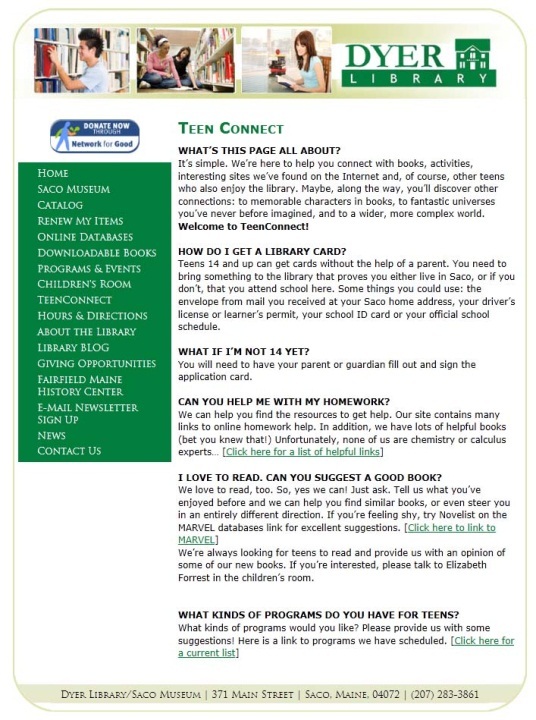 Do teens have access to the catalog search directly from the TLW, or do they need to go to the library website homepage? What can be searched on the TLW? Can teens search the catalog, teen-related resources, website, and so on from the TLW? Navigation: It is easy to move around the TLW and the website overall. How do teens navigate the TLW? Does the TLW have its own navigation (local navigation) or shared navigation (global navigation) or some combination thereof (multiple navigations)? How do teens know where they’ve been, where they are, and where they can go on the TLW? Does the navigation provide indicators for teens to know their current path? To be successful, TLWs need to be easily accessed and used. As a guide, these questions help public libraries evaluate their TLWs to determine how it is accessed and presented to teens. Websites can change frequently, which is why it is important that public libraries consider their specific context when analyzing their TLWs. Overall, this research paper is an effort to understand website models of TLWs. Continuing the work in this area will help librarians better analyze their TLWs and design websites that are responsive to teen users. Future research will augment research with teens on TLWs, expand to additional library population ranges, and address visual design, particularly in terms of a detailed case study of TLWs. In addition, research with teen librarians would provide another dimension to understand the choices that librarians make in regards to TLWs. Institute of Museum and Library Services, “Public Library (Public Use) Data Files: Fiscal Year 2009,” http://harvester.census.gov/imls/data/pls/index.asp. Amanda Lenhart, Mary Madden, and Paul Hitlin, “Teens and Technology: Youth Are Leading the Transition to a Fully Wired and Mobile Nation,” Pew Internet & American Life Project (2005), http://www.pewinternet.org/Reports/2005/Teens-and-Technology.aspx. Amanda Lenhart, Kristen Purcell, Aaron Smith, and Kathryn Zickuhr, “Social Media and Mobile Internet Use among Teens and Young Adults,” Pew Internet & American Life Project (2010), http://www.pewinternet.org/Reports/2010/Social-Media-and-Young-Adults.aspx. Mary Madden, Amanda Lenhart, Maeve Duggan, Sandra Cortesi, and Urs Gasser, “Teens and Technology 2013,” Pew Internet & American Life Project (2013), http://www.pewinternet.org/2013/03/13/teens-and-technology-2013/. Andrew Large, “Children, Teenagers, and the Web,” Annual Review of Information Science and Technology 39, no. 1 (2005): 347–92. Sandra Hughes-Hassell and Erika Thickman Miller, “Public Library Web Sites for Young Adults: Meeting the Needs of Today’s Teens Online,” Library & Information Science Research 25, no. 2 (2003): 143–56. Denise E. Agosto and Sandra Hughes-Hassell, “People, Places, and Questions: An Investigation of the Everyday Life Information-Seeking Behaviors of Urban Young Adults,” Library & Information Science Research 27, no. 2 (2005): 141–63. Denise E. Agosto and Sandra Hughes-Hassell, “Toward a Model of the Everyday Life Information Needs of Urban Teenagers, Part 2: Empirical Model,” Journal of the American Society for Information Science and Technology 57, no. 11 (2006): 1418–26; Denise E. Agosto and Sandra Hughes-Hassell, “Toward a Model of the Everyday Life Information Needs of Urban Teenagers, Part 1: Theoretical Model,” Journal of the American Society for Information Science and Technology 57, no. 10 (2006): 1394–403. Denise E. Agosto, “A Model of Young People’s Decision-Making in Using the Web,” Library & Information Science Research 24, no. 4 (2002): 311–41. Andrew Large, Jamshid Beheshti, and Tarjin Rahman, “Design Criteria for Children’s Web Portals: The Users Speak Out,” Journal of the American Society for Information Science and Technology 53, no. 2 (2002): 79–94. Ibid. ; Andrew Large and Jamshid Beheshti, “Interface Design, Web Portals, and Children,” Library Trends 54, no. 2 (2005): 318–42. Jesse James Garrett, The Elements of User Experience: User-Centered Design for the Web, 1st ed. (Indianapolis: New Riders, 2002). Suzanne Watzman and Margaret Re, “Visual Design Principles for Usable Interfaces: Everything Is Designed: Why We Should Think Before Doing,” in The Human-Computer Interaction Handbook: Fundamentals, Evolving Technologies, and Emerging Applications, ed. Andrew Sears and Julie A. Jacko (New York: Lawrence Erlbaum Associates, 2008), 329–53. Agosto, “A Model of Young People’s Decision-Making in Using the Web”; Jakob Nielsen, “Usability of Websites for Teenagers,” useit.com, January 31, 2005, http://www.useit.com/alertbox/teenagers.html. Joyce Kasman Valenza, “Discovering a Descriptive Taxonomy of Attributes of Exemplary School Library Websites” (PhD diss., University of North Texas Digital Library, Denton, Texas, 2007). Large and Beheshti, “Interface Design, Web Portals, and Children”; Dania Bilal, “Children’s Information Seeking and the Design of Digital Interfaces in the Affective Paradigm,” Library Trends 54, no. 2 (2005): 197–208; H. B. Hutchinson, A. Druin, and B. B. Bederson, “Supporting Elementary-Age Children’s Searching and Browsing: Design and Evaluation Using the International Children’s Digital Library,” Journal of the American Society for Information Science and Technology 58 (2007): 1618–30; Allison Druin, “What Children Can Teach Us: Developing Digital Libraries for Children with Children,” Library Quarterly 75, no. 1 (2005): 20–41, doi:10.1086/428691; June Abbas, “Out of the Mouths of Middle School Children: I. Developing User-Defined Controlled Vocabularies for Subject Access in a Digital Library,” Journal of the American Society for Information Science and Technology 56 (2005): 1512–24. Linda S. Franck and Genevieve Noble, “Here’s an Idea: Ask the Users! Young People’s Views on Navigation, Design and Content of a Health Information Website,” Journal of Child Health Care 11 (2007): 287–97, doi:10.1177/1367493507083941. Wei Ding and Xia Lin, “Information Architecture: The Design and Integration of Information Spaces,” in Synthesis Lectures on Information Concepts, Retrieval, and Services (2009), http://www.morganclaypool.com/doi/abs/10.2200/S00214ED1V01Y200910ICR008; Peter Morville and Louis Rosenfeld, Information Architecture for the World Wide Web, 3rd ed. (Sebastopol, CA: O’Reilly, 2007). Agosto, “A Model of Young People’s Decision-Making in Using the Web”; Denise E. Agosto, “Bounded Rationality and Satisficing in Young People’s Web-Based Decision Making,” Journal of the American Society for Information Science and Technology 53, no. 1 (2002): 16–27. Denise E. Agosto and June Abbas, “High School Seniors’ Social Network and Other ICT Preferences and Concerns,” in Proceedings of the 2010 American Society for Information Science & Technology Annual Meeting (ASIS&T) (Pittsburgh, 2010). Susan C. Herring, “Web Content Analysis: Expanding the Paradigm,” in International Handbook of Internet Research, ed. Jeremy Hunsinger, Lisbeth Klastrup, and Matthew Allen, 233–49 (Berlin: Springer Verlag, 2010); Sally J. McMillan, “The Microscope and the Moving Target: The Challenge of Applying Content Analysis to the World Wide Web,” Journalism & Mass Communication Quarterly 77, no. 1 (2000): 80–98; Christopher Weare and Wan-Ying Lin, “Content Analysis of the World Wide Web,” Social Science Computer Review 18, no. 3 (2000): 272–92. Earl R. Babbie, The Practice of Social Research, 11th ed. (Belmont, CA: Thomson Wadsworth, 2007). Laurel A. Clyde, “School Library Web Sites: 1996–2002,” Electronic Library 22, no. 2 (2004): 158–67, doi:10.1108/02640470410533425. Garrett, The Elements of User Experience. Morville and Rosenfeld, Information Architecture for the World Wide Web. Alan Cooper, Robert Reimann, and Hugh Dubberly, About Face 2.0: The Essentials of Interaction Design (New York: John Wiley & Sons, 2003). Large and Beheshti, “Interface Design, Web Portals, and Children”; Bilal, “Children’s Information Seeking and the Design of Digital Interfaces in the Affective Paradigm”; Hutchinson et al., “Supporting Elementary-Age Children’s Searching and Browsing”; Druin, “What Children Can Teach Us”; Abbas, “Out of the Mouths of Middle School Children: I. Developing User-Defined Controlled Vocabularies for Subject Access in a Digital Library”; Ding and Lin, “Information Architecture”; Morville and Rosenfeld, Information Architecture for the World Wide Web. Robin Naughton and Denise E. Agosto, “Favorite Websites: Understanding Prior Knowledge of Teens’ Mental Models of Public Library Websites for Teens,” Proceedings of the American Society for Information Science and Technology 49, no. 1 (2012): 1–11, doi:10.1002/meet.14504901109. This entry was posted in Volume 6: August 2015 and tagged library websites, teen library website models, tlw. Bookmark the permalink.